If you’ve read the Forrester reports, you already know that “B2B eCommerce will reach $1.8 trillion and account for 17% of all B2B sales in the US by 2023.” At this point, you’re probably already planning to incorporate a B2B eCommerce channel into your wholesale business’ sales strategy. Giving retail buyers the ability to place orders online through a B2B platform at their convenience is now an industry standard. The next step is to choose which B2B platforms you will implement, and that means choosing between a Direct or Marketplace B2B platform model. A Marketplace B2B platform is exactly what it sounds like: brands sell their products wholesale in an online Marketplace right alongside their competitors. 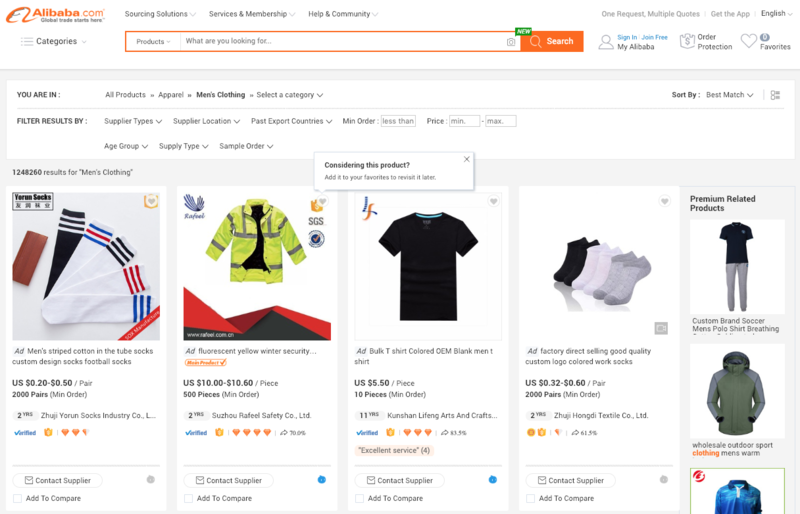 Common Marketplace B2B platforms include Alibaba, DHgate, eWorldTrade and TradeKey. The Direct B2B platform model, on the other hand, involves a brand creating a B2B eCommerce portal dedicated only to their products. Top Direct B2B platform providers include Handshake, Apttus, and Magento, to name a few. Let’s take a look at the differences between these two B2B platforms in more detail. There’s often a belief among smaller wholesalers that leveraging Marketplace B2B platforms will lead to increased visibility for their brand. In many scenarios, this is true. However, competition in a Marketplace tends to favor larger, more well-known brands. In a Marketplace B2B platform, all brands, regardless of their size, are stacked up against each other and the ability to stand out in a sea of competitors is limited. In a scenario where retailers are browsing a Marketplace looking to buy, big brands have a major competitive advantage against their smaller competitors simply because of brand recognition. 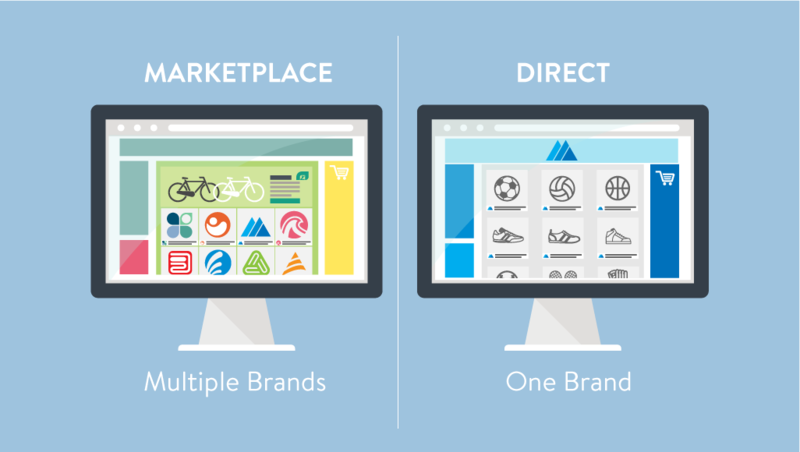 With Marketplace B2B platforms, like Alibaba, your products are positioned against your competitors, side-by-side. In this model, a competitive price and brand recognition is key. So, what can a small brand do to compete in a Marketplace and stand out from other brands? One strategy small brands try to use is to leverage unique marketing strategies to out-position their competitors, but a Marketplace’s rigid templates are often unable to accommodate particular font treatments, colors, videos, and other brand-specific assets. Many small brands respond to the pressure of being transparently compared against competitors (particularly larger ones) by cutting prices. However, price is often an indicator of product quality, and, by slashing margins, smaller brands end up with less capacity to invest in innovation and marketing. This situation leaves them at an even greater disadvantage to larger brands that can compete on the strength of their brand and the perceived quality of their products. In addition, the effectiveness of price reductions is further diminished as other brands enter the Marketplace B2B platform and pursue a similar pricing strategy. Brands that lack efficiencies of scale may find that complex Marketplace B2B platforms allow for a superior customer service experience for their buyers, as many smaller brands have not established fulfillment processes that are as sophisticated and cost-efficient as those of a Marketplace. The best, highest value customer relationships your brand has are ones that order frequently, merchandise your products well and correspondingly have a high lifetime value (LTV). Your goal is to find more of these star customers. Customers that discover you on a Marketplace B2B platform are taking a chance on you and your brand and, accordingly, are placing smaller orders. It’s a transactional relationship very different from your core customer relationship. Brand equity and loyalty are engendered as a positive output of the full range of experiences and interactions a customer has with your company. In a scenario where your products are showcased in Marketplace B2B platform, the brand equity that is being built by the customer is actually the brand equity of the Marketplace provider, not you. It’s their template, user experience, and—when the Marketplace owns fulfillment—their customer service team. Although you may be able to reach new customers and generate additional sales without control of the customer experience, your ability to use B2B eCommerce for brand building is reduced in a Marketplace B2B platform. Your own B2B eCommerce portal is a place for your brand to shine. It gives you a B2B platform to highlight the value of your offering, to provide answers to questions your retailers might have without having to bother them or your back office with phone calls or emails, and to, quite simply, give your retailers a seamless experience to order and reorder on their own time. 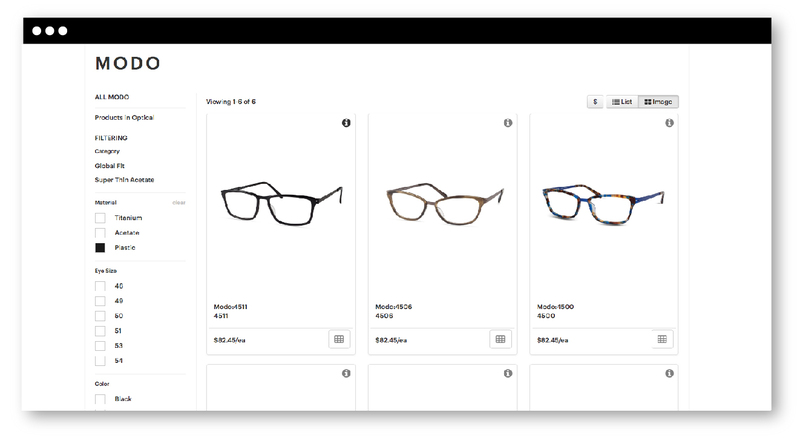 On Modo’s Direct B2B platform, powered by Handshake, their unique eyewear products are able to stand out to buyers, rather than being lost in a sea of options. Your brand as the star of a one-man show means that you are not forced to make pricing and positioning decisions that are specifically driven by a direct comparison to your competitors’ offerings. It gives you the chance to price your goods at a premium and opens up the opportunity to compete on customer service. Although Direct B2B platforms still require reliance on a third-party provider for the hosted eCommerce portal itself, your brand is fully responsible for serving your customers. This ranges from maintaining the brand experience on your B2B platform with the proper marketing assets and product images, processing (and chasing down) payments, and fulfillment of all orders. While there are of course benefits to owning every interaction with your customer base, such as building long-term trust and sophisticated fulfillment capabilities in-house, it is the case that some smaller brands struggle with keeping up with the operational requirements to fully serve their retailers. While this can be achieved upon login using some Marketplace B2B platforms, it is the case that the unknown customer who discovers your brand is unable to benefit from this more tailored experience. While Marketplace B2B platforms have advantages in the form of customer acquisition, the Direct model is beneficial to strengthen customer relationships and focus on the long-term. The customer who accesses your Direct B2B platform is one of high value—it’s a retailer who has done business with you before, has been invited directly to your B2B eCommerce portal by you and your sales team, or has accessed your portal after being exposed to your product line and brand on your website. Given the exposure, experience and personal stake they already have in your brand, they are a more qualified customer that skews higher in terms of average order size, order volume and LTV. Accordingly, customers buying from Direct B2B platforms are worth the service investment, as they are high value. One of the biggest upsides to adopting a Direct B2B platform is that, rather than being forced into the constraints of the Marketplace template—ultimately building brand equity for the Marketplace provider—the attention is on you: your brand, your products, and the experience you want to create for your retailers. The brand experience you create really starts from the discovery of your B2B platform; your customers receive a personal invite or come across your portal from your own website, setting off a brand journey that you are controlling from the start. Your B2B platform is not only a permanent showcase for your product line, it’s a hub for you to distribute other important market assets which help drive sales and grow your brand. Assets like merchandising guides help retailers drive sell-through in their respective store locations. Marketplace B2B platforms offer greater visibility, but they also invite increased competition and less flexibility. Direct B2B platforms require more effort from the wholesaler in terms of service, but also offers complete control over the customer experience. While the Marketplace model does present some advantages, it is ultimately not a sufficient way to serve your high value customers and nurture long-term relationships. Whether you decide to implement only a Direct B2B platform or use it to supplement an existing Marketplace B2B platform, it remains a key part of an effective wholesale B2B eCommerce strategy. As you explore the Direct B2B platforms that are out there, we’d love to be in your consideration set. Reach out to a B2B eCommerce expert at Handshake to set up a demo of our Direct B2B platform, today.